The NHL’s 16 playoff teams are never exactly the same from one year to the next and there is always some level of turnover. If you are looking for a team that might be able to make a Devils- or Avalanche-like jump in the standings in 2018-19, there is a compelling team being constructed in Arizona that — at least on paper — has some of the same elements in place and a lot of the same potential. But when you dig a little deeper into the Coyotes’ rebuild and look at the moves that have been made this offseason, there is a lot of reason for optimism that things could turn around very, very quickly. The number one reason: They have — or at least seem to have — the goalie in Antti Raanta. 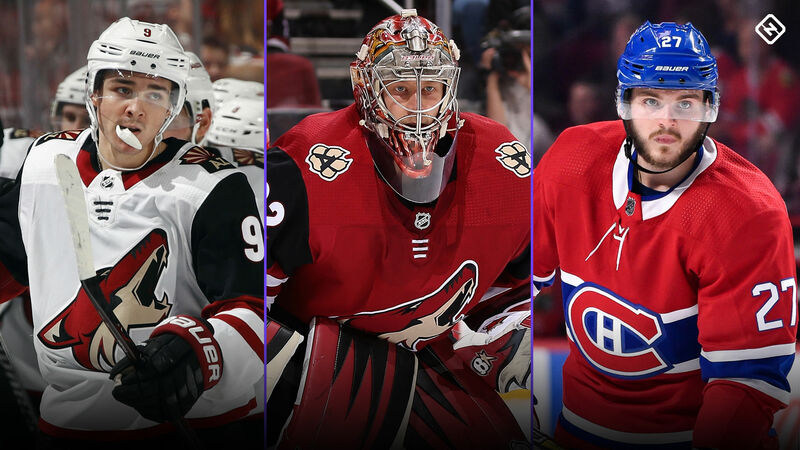 The Coyotes acquired Raanta along with center Derek Stepan in a blockbuster trade with the Rangers before the 2017-18 season in exchange for the No. 7 overall pick in the draft and defenseman Anthony DeAngelo. Prior to joining the Coyotes, Raanta had been one of the league’s top backup goalies in Chicago and New York, where he played behind Corey Crawford and Henrik Lundqvist. He almost always put up strong numbers in that role, and was so good in his final season with the Rangers that he actually started taking some playing time away from Lundqvist at one point during the year. He continued that strong play in Arizona — when he was healthy — and finished with a .930 save percentage in his first season in the desert. That was the best mark in the NHL among goalies who appeared in at least 40 games (Carter Hutton had a .931 mark for the Blues, but he only played in 32 games). Expecting him to repeat that performance exactly and be a .930 goalie every season is obviously too high of an expectation, but even if you assume a slight regression is coming this season his overall career numbers still paint a promising picture because he has been among the most productive goalies in the league. For example: Since the start of the 2012 season, 44 goalies have appeared in at least 140 games. Out of that group, Raanta’s .922 save percentage is tied for the second best in the league (along with Sergei Bobrovsky and Crawford) and just .001 behind John Gibson. His .928 mark at even strength is the sixth-best in the league out of that same group. Keep in mind Raanta played in just three of Arizona’s first 14 games, and in one of them he exited due to injury after stopping all nine shots he faced. With Raanta sidelined, the Coyotes won just one of those games. He missed another eight-game stretch in late November-early December when the Coyotes won only two games. Their backups during those two stretches were a revolving door of Scott Wedgewood, Adin Hill and Louis Domingue, none of whom were able to play at an NHL level. Without him, they were only 8-24-6 — a 47-point pace over 82 games. If that percentage rebounds this season to normal levels, there is every reason to believe Galchenyuk will be a 25-30 goal scorer this season. When combined with Derek Stepan, that gives the Coyotes a pretty solid 1-2 punch down the middle. It’s not Sidney Crosby-Evgeny Malkin, Nicklas Backstrom-Evgeny Kuznetsov, or Auston Matthews-John Tavares … but it’s not bad, either. You can absolutely go to the playoffs with those two players centering your top two lines. The criticism of Grabner is going to be that his goal numbers are boosted by the fact he’s scored 11 empty-net goals during that stretch. But even if you take away every single one of those empty-net goals, he still has 40 even-strength goals (top-30 in the league) and still scores at a 20-goal pace. A 20-goal winger who can kill penalties and create chances because of his speed is a pretty valuable asset. Obviously, there are a lot of “ifs” here, especially when it comes to the young players like Keller, Strome and Chychrun, as well as Raanta staying healthy and matching what he has done throughout his career. But this is a team that in the second half of the season — after a disastrous start where they had significant injuries, a young team trying to find its way, and no goaltending — played at a pretty high level. The Coyotes are not ready to win the Stanley Cup this year, but they have a lot of the ingredients in place to take a huge step forward and perhaps shock the hockey world and make a big jump in the standings — the same way New Jersey and Colorado did this past season.